If you’re still connected to “the Grid”, there will always be times when the power goes out. Ice storms, severe thunderstorms, and bad winds can take down power lines any time of the year and leave you in the dark. Accidents can take out power poles and have you powerless for hours. Even if you’re using solar power, there are times when the sun doesn’t shine for several days at a time and you need to charge your batteries. The best way to have power available all the time is with a properly sized backup generator. 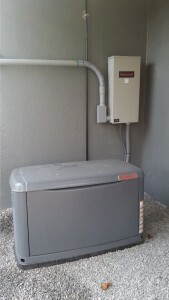 We provide and install generators by Generac with automatic transfer switches to disconnect your normal power source and temporarily connect your alternate power source or a generator that will power your battery charger so that your batteries never completely discharge. All of this takes place automatically and you don’t have to move off the couch. Our generators can be connected to your Internet router and accessed through a smart phone so you know the status of your generator any time… anywhere. The video below simulates the startup sequence of a whole house generator when the primary power source is lost. The system monitors the incoming power and begins this sequence when power is lost for 15 seconds. The generator starts up and gets to full speed in 15 more seconds. If the primary power has not been restored in those 30 seconds, the automatic transfer switch disconnects the primary power and connects the secondary power from the generator.